A Big Sound For Those Smaller Rooms - Designed as a clear alternative to half-duplex handset speakerphones, Voice Station delivers professional quality conferencing to offices and other smaller meeting areas. Why wait for a conference room? Voicestation is affordable enough for just about any office, and is ideal for meetings of up to 4 participants. With it's proven Polycom voice technology and stylish new look, Voicestation is the meet-any-time conference phone that will have everybody talking! If you work in a small to medium sized business, chances are that you are still using low-quality, handset speakerphones to conduct important business with important co-workers and ever customers. Handset speaker phones are fine for listening to voice mail or conducting short conversations, but usually fail to maintain natural two-way communication necessary to maximize productivity and conduct effective business meetings. 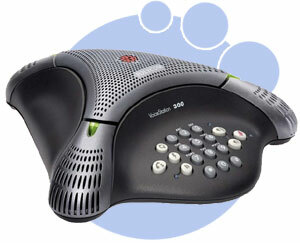 Voicestation is a clear alternative to handset speakerphones when conducting remote business meetings. With Polycom's full-duplex Acoustic Clarity Technology. Voicestation enables natural free-flowing conversation, assuring that everyone can hear and be heard without the need to raise your voice or repeat words or phrases. Polycom's full-duplex audio conferencing are found in more conference rooms, boardrooms, and other meeting areas than all other types of audio conferencing systems combined. Now there's a perfect solution for offices and other small meeting areas. 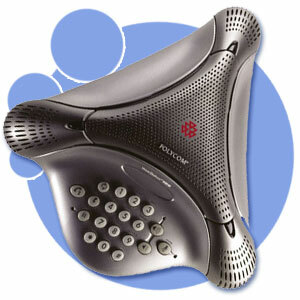 Voicestation by Polycom. Full-duplex is the ability to communicate in 2 different directions simultaneously so that more that one person can speak at a time. Half-duplex means that only one person can talk at a time, which is unatural in normal free-flowing 2-way communications, like conference calls. Voicestation's crystal clear, full-duplex audio allows you to speak in two directions at the same time - as naturally as if you were speaking face to face! Featuring Polycom’s award-winning Acoustic Clarity Technology, the VoiceStation 300 delivers significantly improved voice quality over the previous-generation VoiceStation 100. The VoiceStation 300 features three sensitive microphones that offer 360-degree room coverage. Smart technology, such as Dynamic Noise Reduction (DNR), provides maximum microphone sensitivity, while reducing distracting room and background noise. Plus, Polycom’s legendary full-duplex technology ensures that everyone on the call can be heard. Bluetooth-enabled voice conferencing designed for offices and small meeting spaces The Polycom VoiceStation 500 is a small Bluetooth-enabled conference phone ideally suited for desktops, offices, and other small rooms. With a microphone range of up to seven feet, the VoiceStation 500 is perfect for small conferences with three to four participants. Plus its compact industrial design fits well on a desk or small table, making it a great solution for offices. 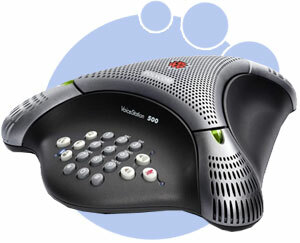 With the VoiceStation 500, you can enjoy Polycom’s legendary voice quality at an affordable price.